Movie by Asghar Farhadi, who also made A Separation (2011) and The Past (2013). Though this movie is older, it was in distribution limbo before coming out in the U.S. last year. I saw this on Netflix more or less by accident (clicked on it when I actually meant to click on something else) and really liked it. Very well-done character study, and managed to communicate a lot without a lot of flashy technique or fanfare. I was a bit uncertain about the end: was the dead woman at the morgue actually Elly? I'm assuming it was because her fiance cried when they showed him the body, but I thought Farhadi left it a bit ambiguous because we didn't actually see the woman's face up close. I have to say that I enjoyed About Elly even more than A Separation and The Past. Although 'enjoy' might be the wrong word here - the movie is quite infuriating. The whole thing is basically about how the moral shields of the upper class are on the edge of braking down; about how the (supposedly) drowned woman demands to be taken just as a human tragedy, and not as a playground for others' social and class relations. 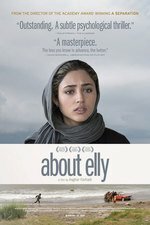 In the end of course, the only character on whom Elly seemed to have any influence, Sepideh, also retreats back to her warm and comfortable cocoon, staying true to her estranged but wealthy morality. But, on the other hand, 'enjoy' is exactly the right word since About Elly is quietly suspenseful and every minute of it is intruiging.